Anybody know the name of the street two pics up, with the shop at the corner? Brilliant photo. IM SURE THATS ANOLD AIR RAID SHELTER INCENTRE OF PHOTO ? 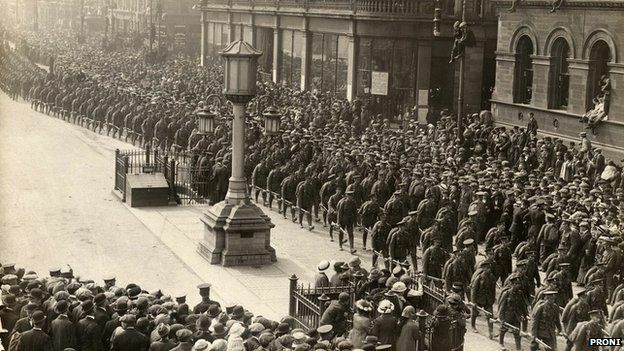 Belfast WW1, May 1915 soldiers of the 36th Ulster Division enroute to war parade along Chichester Street. 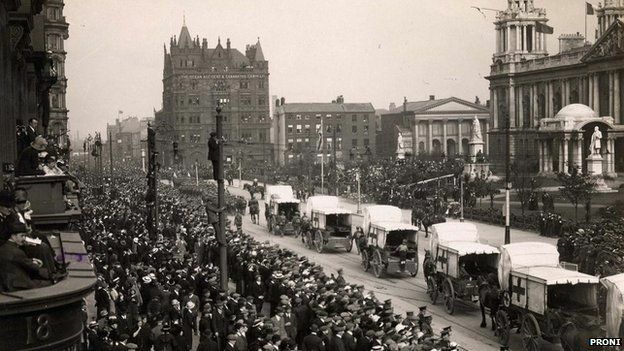 The intersecting street would be Arthur Street, and the parade is about to pass in front of Belfast City Hall. Wow, I can’t believe that my pics from nearly 10 years ago have been resurrected. I thought that Photobucket had zapped them all as they went for subscription a few years ago. Glad to see some of the old names, wonder how Homebird is? This was Pepper Hill Steps in old Carrick Hill. Think it was McDowells Chemist on the corner.